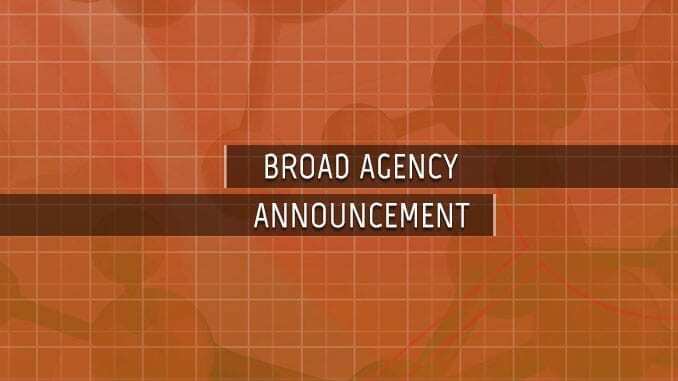 The Defense Threat Reduction Agency recently updated its Broad Agency Announcement (BAA) supporting Fundamental Research to Counter Weapons of Mass Destruction. Issued in March 2015, the BAA is effective through 2024 or until superseded with multiple white paper submission windows. Updates to research funding topics of interest and windows for white paper submissions are issued through Amendments. Topics G1-G19 are interested in research projects that span from those that focus on exploratory aspects of a unique problem or a high-risk approach to those that involve a comprehensive program with interdisciplinary areas. Consistent across all proposals should be the focus on innovative research with the potential for high impact to C-WMD science. DTRA anticipates that the predominance of awards made under Topics G1-G19 will be grants. The pre-application white paper deadline for these topics is 1 February 2017. Further details are available via Solicitation Number: HDTRA1-14-24-FRCWMD-BAA.